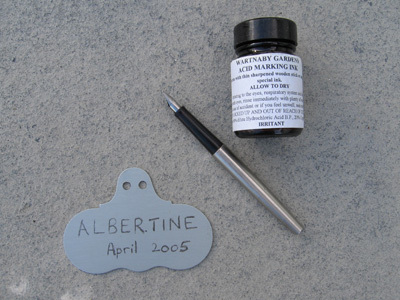 For DIY permanent marking of zinc labels, a weak acid solution or ink best applied by dip or old fountain pen, or pointed wooden stick which etches into the metal. Mistakes cannot be rubbed out! NB The "ink" contains, amongst other things, dilute Hydrochloric Acid so store safely and keep out of reach of children. It comes with a full material safety data sheet and a child proof bottle top.